dramatically lit view eastward across Endeavour Crater on Mars. Opportunity is perched on the western rim of Endeavour Crater looking eastward. The crater spans about 14 miles (22 kilometers) in diameter. Opportunity has been studying the edge of Endeavour Crater since arriving there in August 2011. The photo is a mosaic composed of images taken with Opportunity’s panoramic camera between 4:30 and 5 p.m. Mars time, mostly on March 9, NASA officials said. The scene is presented in false color to highlight differences in materials, such as the dark dunes on Endeavour’s floor. Opportunity took most of the component images on March 9, 2012, while the solar-powered rover was spending several weeks at one location to preserve energy during the Martian winter. It has since resumed driving and is currently investigating a patch of windblown Martian dust near its winter haven. Opportunity and its rover twin, Spirit, completed their three-month prime missions on Mars in April 2004. Both rovers continued for years of bonus, extended missions. Both have made important discoveries about wet environments on ancient Mars that may have been favorable for supporting microbial life. Spirit stopped communicating in 2010. Since landing in the Meridiani region of Mars in January 2004, Opportunity has driven 21.4 miles (34.4 kilometers). 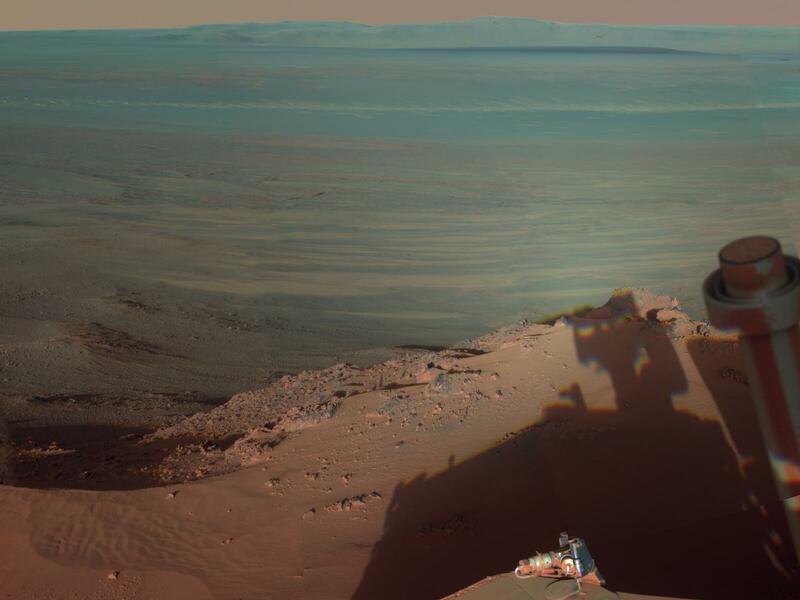 Opportunity will soon have company on the Red Planet. NASA’s newest Mars rover, the 1-ton Curiosity, is slated to land on the night of August 5. The car-size Curiosity’s main goal is to assess whether its landing site is, or ever was, capable of supporting microbial life.